This is a false-colored ultrafast electron microscope snapshot of the thin semiconducting material that the University of Minnesota researchers used to study the movement of heat. Image: College of Science and Engineering. Using a state-of-the-art ultrafast electron microscope, researchers at the University of Minnesota have recorded the first-ever videos showing how heat moves through nanoscale materials at the speed of sound. The research, published in Nature Communications, provides unprecedented insight into how individual atomic and nanoscale features in materials influence the movement of heat. This insight could aid in the design of better, more efficient materials with a wide range of uses, from personal electronics to alternative-energy technologies. Energy in the form of heat impacts all technologies and is a major factor in how electronic devices and public infrastructure are designed and engineered. It is also the largest form of waste energy in critical applications such as power transmission and transportation, where, for example, roughly 70% of the energy in gasoline is wasted as heat in automobile engines. Materials scientists and engineers have spent decades researching how to control thermal energy at the atomic level in order to recycle and reuse it, with the aim of dramatically increasing energy efficiencies and ultimately driving down the use of fossil fuels. 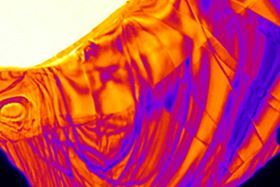 Such work would be greatly aided by actually watching heat move through materials, but capturing images of the basic physical processes at the heart of thermal-energy motion has presented enormous challenges. This is because the fundamental length scales for heat transfer are nanometers and the speeds can be many miles per second. Such extreme conditions have made imaging this ubiquitous process extraordinarily challenging. To overcome these challenges and image the movement of heat energy, the researchers used a cutting-edge ultrafast electron microscope (UEM). This microscope is capable of examining the dynamics of materials at the atomic and molecular scale over time spans measured in femtoseconds (one millionth of a billionth of a second). In this work, the researchers used a brief laser pulse to excite electrons and very rapidly heat crystalline semiconducting materials made of tungsten diselenide and germanium. They then used the microscope to capture slow-motion videos, with the speed slowed by over a billion times, of the resulting waves of energy moving through the crystals. "As soon as we saw the waves, we knew it was an extremely exciting observation," said lead researcher David Flannigan, an assistant professor of chemical engineering and materials science at the University of Minnesota. "Actually watching this process happen at the nanoscale is a dream come true." According to Flannigan, the movement of heat through the semiconducting material looks like ripples on a pond after a pebble is dropped in it; the videos show waves of energy moving at about 6nm per picosecond. Mapping the oscillations of energy, called phonons, at the nanoscale is critical to developing a detailed understanding of the fundamentals of thermal-energy motion. "In many applications, scientists and engineers want to understand thermal-energy motion, control it, collect it, and precisely guide it to do useful work or very quickly move it away from sensitive components," Flannigan said. "Because the lengths and times are so small and so fast, it has been very difficult to understand in detail how this occurs in materials that have imperfections, as essentially all materials do. Literally watching this process happen would go a very long way in building our understanding, and now we can do just that."